Jeff Knight flipped his way to victory in an ABA Toyota Tundra Bassmaster Weekend Series tournament held on Lake Chickamauga, Tennessee this past weekend. Running out of Dayton Boat Dock near Dayton, the Cleveland, Tenn., angler caught five bass weighing 21.34 pounds. He anchored his catch with a 6.23-pounder that won the tournament big bass competition. For the Boater Division victory, he collected $2,394 with another $258 for the big bass. ?I never left the Hiwassee,? Knight revealed. ?I stayed in about 12 to 18 inches of water flipping a jig at day. I concentrated on blow-downs along red clay banks. I lost two 6-pounders.? In second for the boaters, Dale Pelfrey of Rockwood, Tenn., brought in a five-bass tournament limit for 20.02 pounds. He earned $1,198 for his efforts. ?I caught fish on about everything I threw,? Pelfrey said. ?I caught some on a Tennessee Rig and some on a jig. I fished from fairly close all the way to the lower end.? Brandon Roop of Dayton, Tenn., also landed a five fish limit. His 19.52 pounds took third place and a check for $798. ?I fished the south end of the lake and caught the majority of my fish on a jig,? Roop said. ?I fished a variety of different types of cover.? In the Co-Angler Division, Eric Cabrera of Chattanooga, Tenn., set the standard with three bass weighing 12.90 pounds. Fresh off a March 17 Co-Angler Division victory at Lake Guntersville, he anchored his catch with a 5.48-pound bucketmouth that won division big bass honors. For his second win in a month, Cabrera won $1,205 with a $134 bonus for the big fish. ?We fished the upper end of the lake,? Cabrera explained. ?I caught all of my bass on a Tennessee Rig. I put white swimbaits with green backs on it. I didn?t have a fish until about 11:30 a.m. when they just turned on.? Paul Palmer of Madisonville, Tenn., fished in second for the co-anglers with a three-bass division limit weighing 11.21 pounds. His biggest weighed 5.39 pounds, just short of division big bass honors. For second place, Palmer pocketed $602. ?I lost a couple fish, but I don?t know if they would have helped me,? Palmer admitted. ?We fished up the lake.? 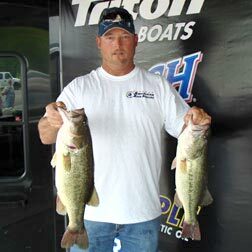 In third for the co-anglers, James Bullard of Harriman, Tenn., landed three bass for 10.27 pounds. He anchored his bag with a 4.05-pounder to take home $402. ?Most of my fish hit a chatterbait at the upper end of the lake,? Bullard said.